Pugs love to travel. You can make traveling with your Pug a little easier by keeping a few important things in mind. When you get a Pug you know you have a companion for life. Left to their own devices a Pug will spend every waking (and sleeping) moment with their owner. It seems they were put on this earth to make their owners happy. That’s a good thing. The question facing most Pug owners is that, on occasion, they want to take a trip and the question they always ask is: what’s the easiest way to travel with my Pug. How do I keep my best friend happy and safe? Traveling with your Pug can be easier than you think. Let’s approach this question from two different angles. First, the short trip – no more than a few miles from home – what’s the best way to transport the little guy? Second, the extended trip – maybe a vacation or an extended trip involving an overnight stay – how do I prepare and is it good for the Pug? On the question of a short trip we’ll assume that the trip will be taken by car. 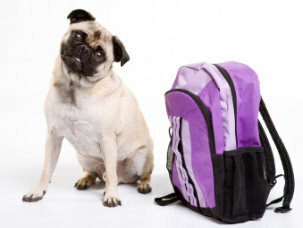 Not surprisingly, the rules that apply to traveling with a child have a lot of application to traveling with your Pug. Safety is the first and foremost concern. Stop and think for a minute, although it might be convenient to let your Pug hop in the car with you, you would be devastated if anything bad ever happened to your companion. Traveling with your Pug requires some common sense rules. First, never let your Pug in the front seat especially if your car is equipped with air bags. There’s a very good reason children under a certain age (usually under 12) are not allowed in the front seat. They can be seriously injured if the air bag deploys. The fact is that your Pug could be killed if the air bag deploys while he is “holding court” in the front seat. Yes, they love to sit next to their owner in the front but, for their safety, put them in the back seat. Your Pug should also be strapped in for their own safety. There are pet safety harnesses available to keep your Pug safe during care travel. They hook right into the seat belt. Many state laws require seat belts for drivers and passengers because they have been proven to save lives. Why would you not exercise the same caution for your Pug? Remember, when you're traveling with your Pug, you are the primary keeper of their safety. Many Pug owners insist on crating their Pugs when they travel even for short trips in the car. We became convinced of this ourselves after hearing a very harrowing tale. 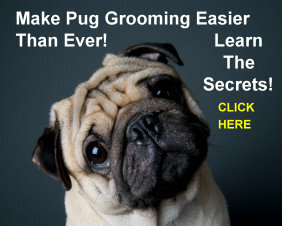 You can read about it on our Pug Safety Page and we invite you to share your stories with us as well. Safety should be every Pug owner's top responsibility. So now let’s discuss extended travel. While packing for your Pug may seem a little overwhelming, it probably was a little bit of a daunting task to pack for yourself or for your family as well. It does get easier the more times that you do it. The more times you do it the more natural traveling with your Pug becomes. You might want to keep a master checklist that you keep adding to after each trip. The first trip will almost always yield a few additional items that you did not anticipate so, if you keep adding to the list, after just a few trips you’ll have one that becomes second nature for any trip that you’re planning. Here are some of the things you might find especially useful as you embark on a “field trip” with your Pug. You might want to consider bringing his crate. If it can fit in your car, your Pug might find it very comforting. It’s familiar to him and can be very comfortable especially if it’s lined with something soft like a towel or blanket. It’s a familiar place for him to sleep and can provide an added measure of safety. If you’re staying somewhere for an extended time, bringing his crate provides him with a very familiar “home away from home”. One of the advantages of owning a Pug is his size. When you calculate how much food to bring you’ll be happy that your little Pug doesn’t eat as much as a big Saint Bernard. You can’t always count on finding the “exact” brand of dog food your little friend is used to and when you travel you have enough different things happening around your little friend. If he can keep eating the same food as he always does it's one more thing that will make your trip go easier. To keep things as familiar as possible, if you can bring along his food and water bowls it will just make things go a little smoother. You absolutely must bring along his collar, leash, identification tags, harness and medications. You want these things handy if your Pug let’s you know he needs to stop along the way. The last thing you want is a frantic pup and have to be looking around for his leash while you are parked along the side of a road and all your Pug is worried about is to find a “spot” as quickly as possible. A little preparation can save a lot of grief on both parts. By the way, so far we've talked about traveling with your Pug by car. We’ll talk about air travel a little later. What you bring on your trip should be focused on your Pug’s comfort and safety. The more thought you put into planning, the easier traveling with your Pug will be. While your dog’s crate can double for a bed, if your Pug is used to sleeping on a special bed and your car can accommodate it, by all means bring your Pug’s favorite bedding along. You should also bring your Pugs favorite toys along as well as a supply of his favorite treats. If your Pug is paper-trained bring doggy pads or newspaper. Make sure you bring along his grooming supplies as well as a first aid kit. It’s very important to bring along a water supply. Water is very important for your Pug. Many people have gotten into a habit of bringing or buying bottled water for themselves. It’s our suggestion that you consider the same for your Pug. Tap water in many parts of the country is very different from the water that you may have at home. When traveling in the summer be especially mindful of your little friends water consumption. Pugs are very susceptible to over heating. In fact, Pugs are susceptible to catching a chill in the cold weather as well so, if you’re traveling in the cold weather, it might be a good idea to warm your car up before your Pug gets in. It’s not unlike when we traveled with our children. We never put our babies into an ice cold or deathly warm car. We don’t do it to our Pug either. Pugs can be delicate creatures. That brings us to air travel. While we don’t want to be alarmists, Pugs are susceptible to breathing difficulties. It’s just the nature of the breed. The thinner air of plane travel can cause problems and there is some evidence of Pugs having breathing difficulties during air travel. 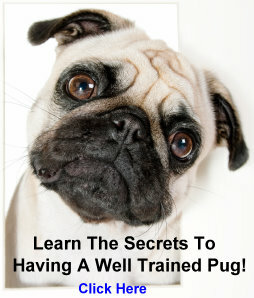 It’s something to consider and ask your vet about but we would be cautious with any Pug but especially a senior Pug. Senior Pugs require a little extra Tender Loving Care. Added padding in the crate to absorb the bumps during travel (car and air travel) plus a little consideration about the pace of any planned travel can go a long way in keeping your friend happy and healthy. The bottom line is that your best friend loves to travel and traveling with your pug can be a very rewarding experience if you approach it in a prepared way.